In this month’s issue of Supply Chain Management Review, I share my perspective on the role and future of “social” technologies in supply chain management (see “The Social Side of Supply Chain Management,” available to subscribers). The article is over 4,000 words (the longest work I’ve written in years) and it covers a variety of topics, including the misconceptions supply chain executives have about social technologies; the current state of “social networking for business” and where the technology is heading; and some lessons learned and recommendations based on the experience of early adopters. Social networking is not about socializing, but about facilitating people-to-people communication and collaboration, which is at the heart of managing and executing supply chain processes. Social networking goes well beyond Facebook, LinkedIn, and Twitter—it includes virtually all of the leading software vendors that companies currently use to manage their business processes. We’re seeing the rise of Supply Chain Operating Networks, the business equivalents of Facebook and LinkedIn, which are enabling communities of trading partners to communicate, collaborate, and execute business processes in more efficient, scalable, and innovative ways. If deployed and used correctly, social networking will result in less work, not more for business professionals. Despite the growing momentum, we are still in the early stages of companies using social networking solutions in business, particularly for enabling supply chain and logistics processes. Almost 62 percent of the supply chain professionals we surveyed said that their companies hadn’t implemented a social networking solution yet, while another 27 percent didn’t know. The low adoption rate is partly due to the challenges discussed earlier [in the article], as well as the fact that social networking capabilities are less developed for supply chain applications at the moment compared to other business functions, such as marketing. Our survey respondents ranked “The ability to connect (like LinkedIn) with business colleagues and external contacts” number one, followed by “Document sharing and collaboration” and “Discussion forums to discuss business-related questions and topics with colleagues and external business partners.” In short, two of the top three capabilities are related to peer-to-peer learning and networking, which underscores the role and importance of people-to-people communication in supply chain management. Due to an oversight on my part, the survey did not include what I view as the greatest value a social business network has to offer: network-based business intelligence and analytics. 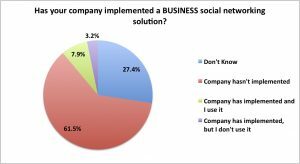 The ability to discover and establish new business connections, either company-to-company or person-to-person, is another key value proposition of social business networks (the survey respondents ranked it in the middle of the pack). [For related commentary, see “Facebook Graph Search, Through a Supply Chain Lens”]. The bottom line is that we’re still in the early stages of using social networking technologies for supply chain management, but I believe the best is yet to come. I predict we’ll see more innovation and market adoption of supply chain operating networks (or, if you prefer, “social business networks”) over the next two to three years than we’ve seen in the past decade. In five years, if not sooner, we won’t be talking about “social networking in business” any more. It’ll just be business as usual, just like “e-business” became business again. What do you think? Post a comment and share your perspective on this topic! Adrian, could not agree with you more. There is still a a great deal of skepticism because social media is perceived as being a “drain on company resources.” It’s almost notable how many people block sites, but then the behavior is directed to phones, sending people out of their work flow and making them less efficient. Maersk (love them or hate them) has made a *huge* foray into social and even set up a website to that effect. There was an awesome story about them in McKinsey & Co’s CMO Forum talking about how SIXTY EIGHT PERCENT of the people they surveyed had a higher perception of the brand thanks to their efforts. For a company that uses it wisely (or has a company manage it for them), it’s a relatively low cost way to build brand on a national or global basis. I agree with you Adrian. Social media can be a key part of any business. It allows for interaction between you and your customers, and it is a place where they can even communicate with each other. Social media can strengthen the relationship you have with your customers, by providing an easy way to stay connected. Although social media is still in its beginning stages here in the supply chain industry, it is vital. It is a place where you can provide substantial information that can benefit your customers, along with real-time feedback from your customers that you can respond to which can be quicker than a customer service phone call. It is also beneficial because it gives you visibility into the conversations going on about your company and your competitors. Social media is growing, and will continue to grow in the supply chain industry.